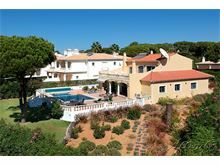 Terra Nova offers a peaceful setting near The Old Village of Vilamoura, situated in a double plot the house has plenty of grounds and lush green lawns surrounding the pool terrace. Retractable shades provide the perfect setting for a shady barbecue or to cool off from the hot sunshine. 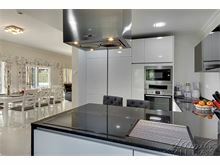 The living area is open plan with a luxury kitchen that provides the desirable social set up perfect for villa holidays, double fridges and the highest quality fittings will make eating in a delight. Casa Terra Nova has always been a favourite with our clients and as the owners use the villa as a second home you will find it fully equipped with everything you need complete with large screen TV in the comfortable living area overlooking the pool terrace. 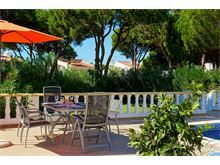 With The Old Village centre just 10 minutes away on foot and the main part of Vilamoura approximately 25 minutes walk away Terra Nova is ideal for those who do not wish to totally rely on a hire car on holiday. 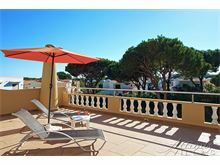 Approximately 4kms from the beach and 1km from the shops,Vilamoura centre approximately 25 minutes walk. 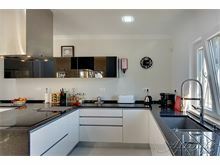 Ground Floor: L-shaped living/dining with TV and doors to pool area, open plan fully equipped kitchen, double fridge/freezer, induction hob, dishwasher, microwave, separate laundry area. 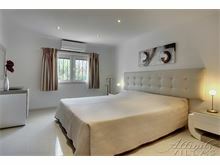 Twin bedroom with en suite bathroom. 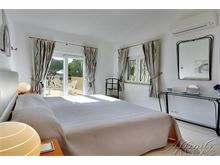 Twin or double bedroom (please request bed make up at time of booking, standard set up is twin) with en suite bathroom. 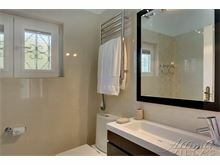 First floor, 1 double and 1 twin bedroom each with en suite bathroom. Maid service 5 times per week. 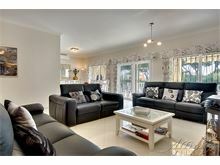 Pool heating, air conditioning and WiFi are available at extra cost if required. 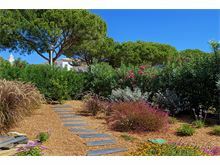 Casa Terra Nova is a superb villa in a quiet residential area of old Vilamoura. 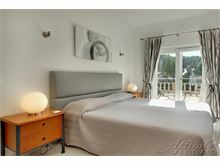 The villa itself is splendidly equipped, furnished to a high standard. Very comfortable a real home from home feel. 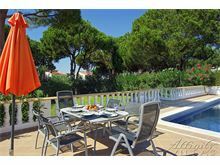 The outside area is roomy with a lovely pool area, BBQ and gardens. The tranquility of its setting is ideal only a short 5 minute drive to the marina if desired for some exquisite restaurants. Definitely recommend for couples and families. We are a family of five with teenage boys. 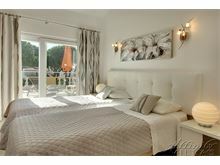 The villa was perfect for our stay in Vilamoura. 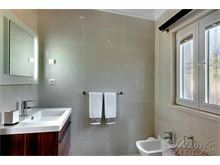 It is spacious, beautifully finished and spotlessly clean. 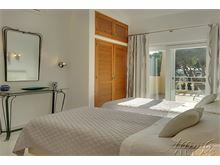 The location is convenient for access to local facilities and the marina. A car isn't necessary as there is a tourist road train which travels around the resort with various pick up points and local taxi services are very good. If however you want to explore the region then a car is essential to travel to some amazing beaches and resorts along the coast. 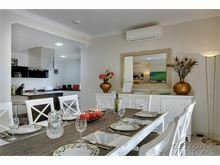 There are supermarkets nearby for self catering and a number of excellent restaurants if you want to dine out. 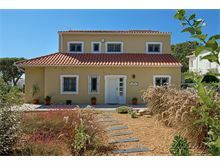 All in all a very nice week and we would have no hesitation in recommending the villa to anyone considering a holiday in the Algarve. Wonderful stay at Casa Terra Nova. Villa is even better than the pictures. The terrace upstairs is also much bigger than I expected. Kitchen equipment very good, even managing to bake a birthday cake! Outdoor area bigger than I expected as well and loved the pool!! 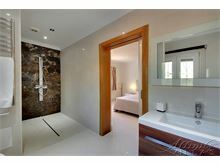 The villa is modern, clean and had everything we needed. 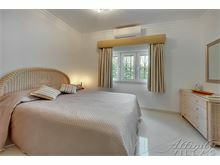 The bedrooms were perfect for our family requirements. 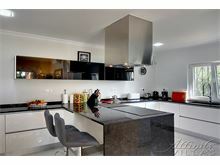 The kitchen was superb! and made eating in a pleasure. On hind site we should have booked the pool heating. The wi-fi was great, TV and entertainment facilities (when used) had endless choices. Nice quiet area, close to a few restaurants and a local shop in the Old Town. A short drive from a larger supermarket selling a wide range of fresh food. All-in-all perfect. We were fortunate and privileged to stay at Casa Terra Nova for 5 weeks. 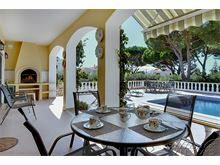 The Villa has absolutely everything with a Great Pool and beautiful gardens. A Great Team looking after us if we needed anything. Thank You. We have fallen in Love with the Algarve. 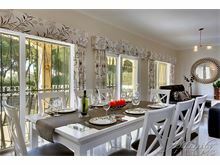 Casa Terra Nova provides excellent accommodation for 8 and is stylish, upmarket and in an excellent peaceful location. walk away and opposite the Hilton Hotel. 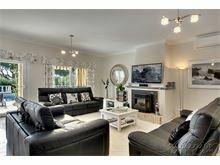 Nothing not to like about this fantastic Villa we are definitely ready for our third visit. Villa was amazing. Everything we needed and much more. Brilliant holiday can't wait to go back. Casa Terra Nova is a superb villa. It is well equipped and maintained. 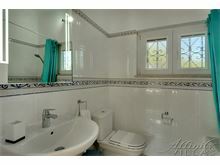 This is our second visit... who would not want to stay here, the facilities are excellent. The villa was lovely a real home from home and everything that you needed was there, it was in a very nice area. We paid for the pool to be heated and we weren't disappointed some times it was like a bath! The house manager came to the house to greet us and she was on the end of a phone if you needed her. 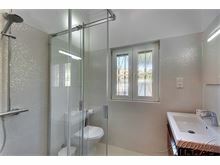 If you are thinking of going to Portugal and you want a bit of luxury then this villa will not disappoint you.